Fear not, the blue mood that took over my last post seems to have passed. I attribute it to all the wonderful thoughts, hugs and positive energies you guys sent out to me. Thank you so much - sometimes just knowing people all across the WORLD are thinking of you really does work wonders. Easter turned out okay. Pea stayed here with us, and it seems the rift with his parents is on it's way to being resolved, so we are all hopeful. It's quite a complex situation that I won't get into here, but we are hoping to help them get the help they need. A quiet Easter with my parents turned out to be really nice and very relaxing, and I think we were all ready for that. Aunt Mandy and Uncle Tom were here from Friday night until early Sunday morning, and we had the best time!! Saturday was also my mom's birthday, and having her "baby" sister here to celebrate with her made the day even better. We went up to the Native American museum and had a wonderful time. (Like a good blogger I snuck my camera in and took the bootleg pictures you see on the left!!) We then headed over the other casino to show them the great atmosphere there. I even managed to finagle a half hour on the nickel slots, and came away $20 richer!! Who needs a job when you can make $40 an hour playing slots . . . tee hee!! We're already more than half-way through April, and my Project Spectrum content has been non-existent. I have a lot of yellow around here, so instead of doing one HUGE post, I think I'll add a little PS Content to each post until I've shown you everything I have. Up first is my Project Spectrum Knitting content - my socks and another washcloth. The washcloth will be cast on as soon as the pink one is finished, which may very well be today!! Blurry picture = too much coffee? 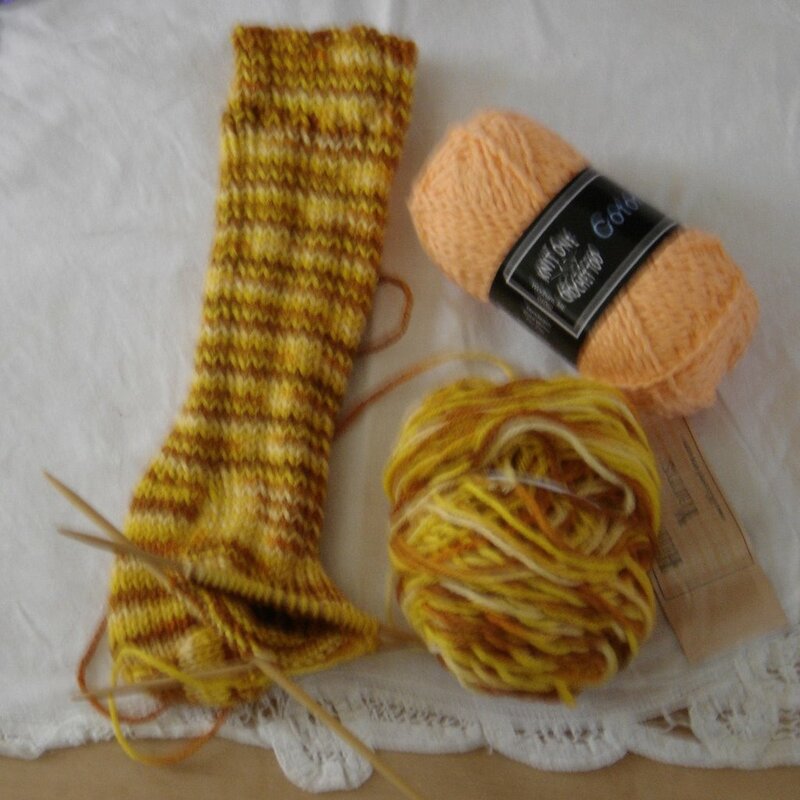 The sock is also knitting up very quickly - thanks to the Instant Gratification sock yarn and the size 5 needles! At first, I wasn't crazy about the color of this yarn - the gold in it didn't really appeal to me. But it's growing on me . . although I'm a bit disappointed with the pooling where I began the instep. I had a hard time settling on a name for this sock. Pea suggested Mellow Yellow . . . but that seemed too obvious to me. I was partial to That '70s Sock, because the colors just screamed '70s decor to me. But in the end, my heart belongs true to my man, so I've named them the Fields of Gold socks. The future may hold other socks with musically inspired names as well. I've already got a few other Sting socks floating around in my head!! Mmmm, great song. Thanks... now I have Sting to serenad me all day! So happy to hear your visit with your aunt and uncle worked out better this time! I think That 70's Sock is a cute name but the song lyrics idea is great! To answer your question, yes I used jelly to dye my sock yarn. But I mean jelly as in Jello. Not jelly as in jam. I.e. the powdered stuff that you pour hot water on and it sets. I'm so happy to hear that you're feeling better (me too!) and that you had a nice day afterall! I'm glad to hear you're feeling better, the wonderful weekend weather was really needed. The egg was fun to knit, though now everyone in church thinks I'm nuts, because my son brought in to show what I did! Socks on size 5 needles? Is the pattern anything unusual - or just do the math after swatching? Glad to hear you're in a better mood and that you had a good Easter! 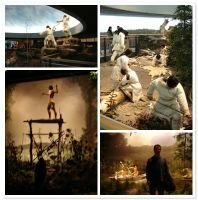 A good friend of mine used to work at the Pequot Museum. It is so great that you got to visit! I absolutely love your sock, such gorgeous spring colors, and you've already done such great progress with it! that is some insane sock yarn! and look at you go! it's almost done! I am glad that everything worked out alright for Easter. I hope that in the end, it goes well for everyone. Your "Fields of Gold" look wonderful. I cannot wait to see your washcloths! I like "that 70s sock" I name things that look like they came from the 70s "that 70s (insert thing here)"
Glad to hear things are better for you now. forgot to say LOVE the native American piccie! I have NOTHING up on my blog for this months Project Spectrum....I have something that I started last month that falls in it and thats it! I have had a bad month. Not really in the mood to knit anything to the end. Just want to start lots. I like the Fields of Gold socks. What's getting in the way of my knitting? Come on in for a visit.